Move over Reeder, Feedly, Digg, NewsBlur, Feedbin and the rest of the RSS players who hope to pick up some new users with the impending demise of Google Reader. Facebook may also be looking to wade into the game. Asked whether Facebook is planning to launch an RSS product, a spokesperson for the company told TechCrunch, “We’re not commenting.” But there are some hints in Facebook’s Graph API code that could indicate otherwise. Lines of code referring to “rssfeeds” have recently started to appear in Facebook’s Graph API code. Linking the RSS feed to a user’s Facebook ID, the code schema also covers such aspects as title, URL and update time. Each RSS feed subsequently has entries and subscribers. Sleuthing developer Tom Waddington, who brought the new RSS code to our attention, notes that when he tried to run this new code through Facebook’s Graph API Explorer, the results come up as restricted only to whitelisted addresses. While Google has decided to shut down its Reader product because “usage has declined,” it pointed out at the time that “the product has a loyal following.” Facebook, always on the search for users to spend more time on its site, could use an RSS service as one route to achieving that, while at the same time getting its chance to play the hero out of one of Google’s many bouts of spring cleaning. It also makes sense that Facebook would want to offer users an alternative way to consume content on its platform. It’s already become a go-to homepage of sorts for users aggregating news, information, social updates and entertainment feeds into one stream; this could be used as another. It could also be connected with a rumored update to Notes to better compete with Tumblr. This too could use an RSS feed to bring in content. Indeed, what the code doesn’t seem to make clear is whether the feeds would be of Facebook content or content from the broader web. Nor is it clear that whatever RSS feeds end up powering, it would ever be positioned as a straight Google Reader replacement, since, as my colleague Sarah points out, RSS never went mainstream so most users would not know what this means. Creating a feature that could aggregate content from the wider web would make sense: if Graph Search already lets you look in the wider web for content, why not an RSS feed to help aggregate that better? 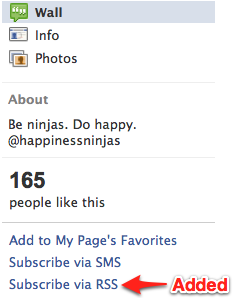 In December 2012, Facebook dropped Subscribe in favor of a new “Follow” feature. At some point around that and the Timeline update, it appears to have quietly dropped the “Subscribe via RSS” feature. You can still apparently subscribe to a Page in RSS, but it’s not exactly one step. (Here’s an example of a slightly laborious how-to.). Facebook also lets users create RSS feeds for their own Notifications, but again it’s not something you can do with one click of your mouse. In both cases, there are separate windows and manual copying of code involved — easy and nothing for some geeks; but not a mass-market opportunity. The new code that’s appeared describes connections from a user to RSS feeds, an RSS feed having multiple entries, and each RSS feed being subscribed to by multiple users. “It’s *exactly* what you’d code to start up a Google Reader clone,” he says.